Factory 506: It's a Wrap! 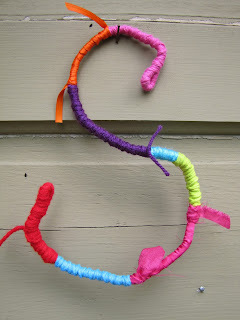 I am back at the rope wrapping, but this time I wanted to make a letter "S" for a cute little girl who is having a birthday today. Hello double digits!!! I must have been thinking about it when I fell asleep last night, because I totally had a dream about making this "S". 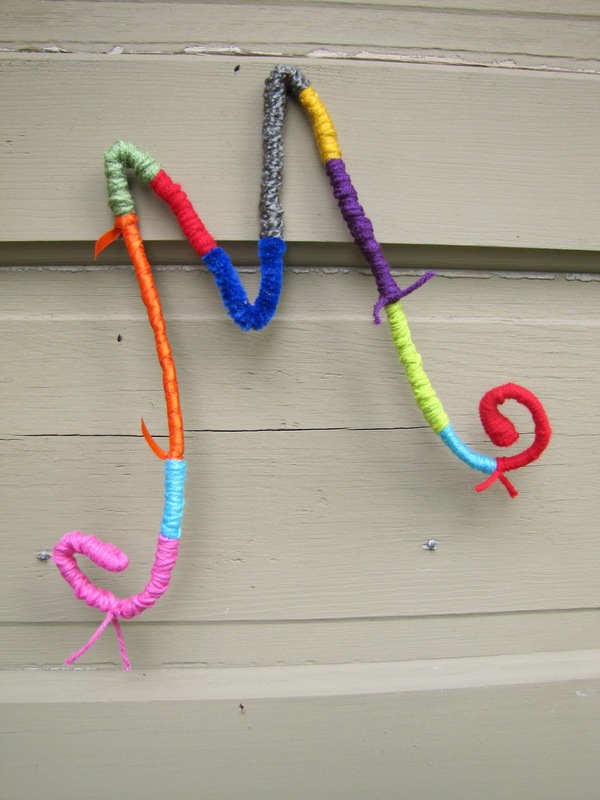 You make it exactly like the wrapped rope project here. But you add a secret ingredient, wire!!! Isn't she cute? Naturally, I could not stop at just one letter. I did an "M" too, for my last name! Then I really got on a roll and did a heart, but not just a heart. 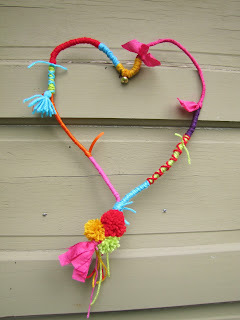 A dolled up, pompom and tassel accessorized heart, with a tiny bell on it! So what originally started out as a project to use up scraps has turned into somewhat of a compulsion, or obsession. Whatever, I can't stop wrapping things. And I love that you can make them as plain or as fancy as you like. I made some tassels and pompoms for this one, then I found a jingle bell, so I added the jingle bell. And my friend had the brilliant idea of adding antique keys to her wrapped rope!!! There is just no wrong way to make these beauties. My kind of project! Look how cute the heart looks hanging on my favorite prop, the urn! Here are some easy instructions and "how to" pictures, if you are interested. Before you cut your cord and wire, loosely make the shape of your letter or heart so you know how long to make the cord/wire. I always cut a little more than that in case something goes wrong. 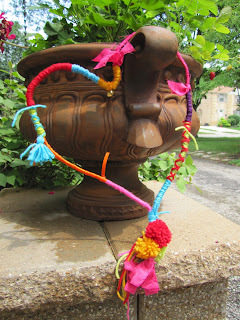 Then start it by tying the yarn on the rope or cord. I like to make a loop on the ends, because you never know when you are going to want to hang things from the ends. Now just place a piece of wire (I used 19 gauge from Ace Hardware) along side of the cord and wrap over the cord and wire together. 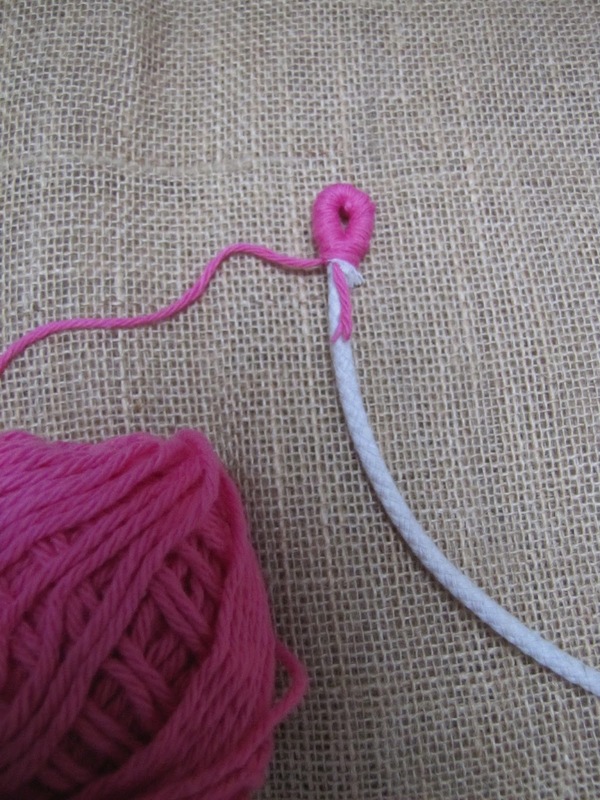 When you are making a letter or a shape, it is a good idea to loosely make the cord/wire into that shape every now and then as you are wrapping, just to make sure you don't end up with two spots of the same color right next to each other on the final shape. 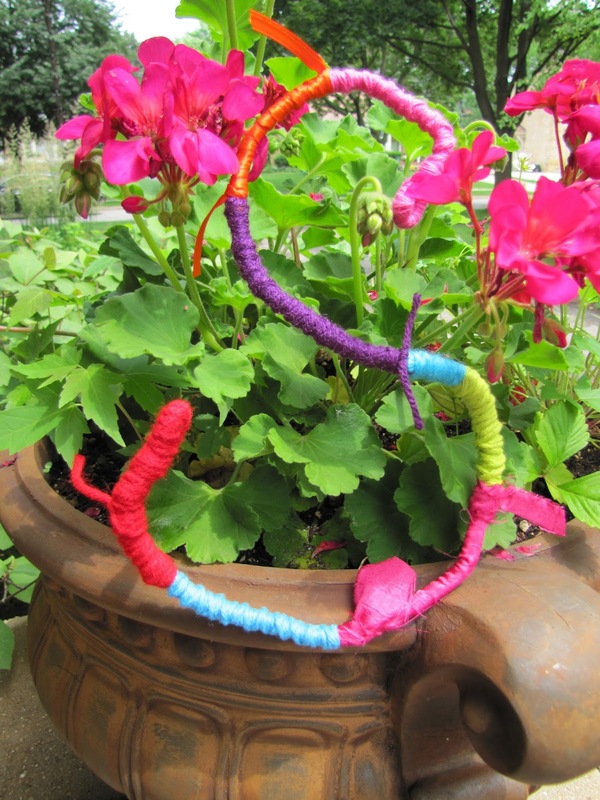 You don't have to worry about that if you are just wrapping the rope as a garland, because it is continuous. When you have wrapped the entire length, make a loop at the end and tie the yarn off in a simple knot. 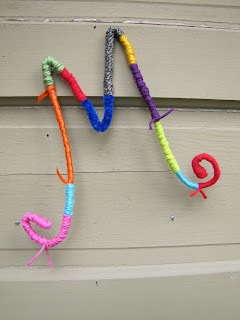 Now just reshape the wrapped rope into the letter or shape you want! So easy and so cute! Have you made the wrapped rope yet? Would you make a letter, or number? Or a shape, like a crown? Awww, she is just the sweetest!